Let’s face it, most of us don’t live the sort of lives that allow us to indulge our love of piracy – we don’t own sloops with cannons, we can’t walk around our neighborhoods with swords strapped to our hips, and so on. This is where Massive Multiplayer Online Role-Playing Games (MMO) are such a wonderful modern creation. For those not familiar with the concept, an MMO is essentially an online world where you create a character and do whatever it is you wish you could be doing in real life. For people like us, this usually means looting and pillaging. Disney’s Pirates of the Caribbean Online is a relatively young MMO – it’s only been live for a few months and is still growing and developing to best suit the desires of its players. In it, you create a pirate character – male or female – and customize their look to suit your tastes. The characters are a little cartoony, with the menfolk being rather burely and the girls leaning towards the cutesy, but this works well enough considering that the game itself is a bit fantastic and cartoony, rather than attempting to mimick reality outright. Early game play is carefully guided by local non-player townsfolk, including some memorable faces from the Pirates of the Caribbean movies. Initial missions help you earn and learn the arts of cutlass, sailing, cannons, and pistols. It’s not long before the gameplay frees up, at which point you can continue on the main storyline quests (which get increasingly more difficult), but can also engage in ingame “extracurricular” activities to expand your skills and wealth. Things such as sailing and gambling can be done between yourself and ingame characters, but grow much more rewarding (and more fun) when you work alongside other players – real people you can interract with, learn from, chat with, etc. What you can’t do, noteably, is stab them and steal their money. This is a Disney game, after all, and Disney has made a great effort in keeping this game fun and safe for all, without sacrificing the piratey feel. There’s plenty of fighting, mind you, but you’re not allowed to shoot other humans (real or ingame), and cutlass attacks to foes merely result in the enemy falling down and dissappearing – no bloodshed involved. Of course, if the enemy bests you instead, you fall down and land in prison, being none the worse for wear except being “groggy” for a while, resulting in slowed reaction and health. PotC Online’s weakness aside, the game remains fun and charming. If missions get old, there is still much to be said for logging on after a hard day at work and meeting your friends to shoot cannons at the Navy for a couple of hours. And the game developers are clearly working to expand the game’s variety and playability – new clothing, haircuts, and tattoos were just added as ingame features (previously you were stuck with the look you chose at the beginning), and interviews have implied that new locations and missions are currently in the works. This entry was posted in Games and tagged children, disney, pirates of the caribbean by Bilgemunky. Bookmark the permalink. I’d reccomend this, purely for the ship combat. Great fun with some friends. 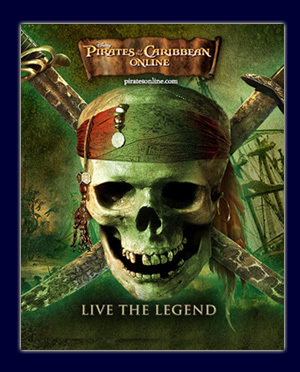 My biggest complaint with PotC Online right now is that they have restricted an enormous amount of the game if you do not pay the monthly subscription fee. For players who have no issue with this, that’s all fine and dandy. But for people who were initially drawn to the game because it was advertised as free, this is rather irritating. Without membership, you are limited to only have lvl5 in any of the skills, and some skills are off limits. You cannot customize your character any further than what you start out with, and you are limited to only the light sloop and light galleon for your ships. If you want any of the other 7 ships, you have to get a membership. Otherwise, it is quite enjoyable.